In general, feeding of wild deer is not a popular pastime in the UK and this is probably to their favour. Wildlife services in the USA have considerable problems with landowners putting out food for deer during the winter months. The issue revolves around the fact that deer are ruminants. As mentioned elsewhere (see Food & Feeding), deer share a syntrophic relationship with numerous species of microbe that breakdown the food they eat. Moreover, the species of bacteria, protozoa, fungi or archea present is related to the individual deer’s diet. Thus, a deer feeding on grass and saplings have different species of bacteria to one feeding on bark and heather. This presents a problem when putting out food for them. In Montana, for example, people put out corn and hay for deer over the winter months. The deer—which have been grazing in spring pastures—don’t have the gut microorganisms necessary to digest this food. Unfortunately, deer are understandably unaware of their digestive predicament and will usually eat the food regardless, but the food remains in the stomach undigested. Consequently, it is not unknown for deer to starve to death with full stomachs. Word of feed troughs spreads rapidly in the deer community, and a single trough can attract great numbers of deer. 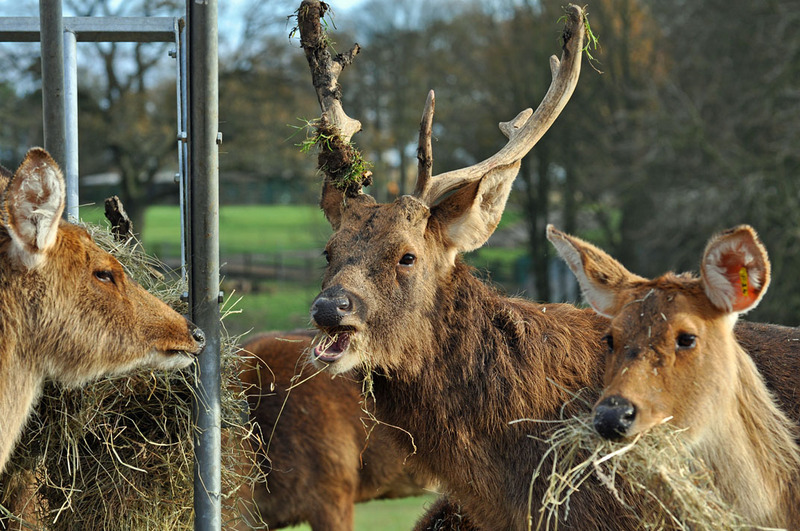 This means that the cost of feeding the deer begins to escalate rapidly, especially considering that they need about 1.5 kg (3.5 lbs) of decent vegetation per day. According to Montana State University, the presence of a feeding trough can also cause deer to become abnormally competitive (striking each other with hoofs) and young deer, which are often in greatest need of the food, are kept away by larger individuals.